Today I was invited by one of my best friends, Ellie King, to join her and her family for a New Year’s party in North Wales. The evening was to start with a meal and be followed up by a some dancing, which I was looking forward to. I thought the arrangement was to meet at my house at 3:30 pm and then I was to travel with Ellie’s family to the hotel. Unfortunately I got the times mixed up and when Ellie arrived at my house it was 2:15 pm and I was still travelling back from the hairdressers 🙁 Luckily they said they would wait and so my Mum finished packing my overnight bag with Ellie’s help and found the dresses I had left out to take with me as I could not decide which to wear. It was a fast turnaround once I arrived and after saying my farewells to my parents I dashed off. Shortly after I had left, my Mum sent me a text to say that I had left without recording today’s verse. I had completed the drawing in the morning and had intended to record my verse just before leaving for the party. When I arrived at the hotel Ellie agreed to film me on my phone but then the next problem was getting the recording to my Dad to upload for me. It took ages to sort out a WiFi connection and luckily it seems to have worked, so I hope it turns out okay 🙂 If not I will record it again tomorrow. I think it looks great!! And I like the picture where the party is going to be held too. Hope you have a good time. Happy New Year! Hi Alisa, the hotel was in a place called Bodelwyddan, the music was good and I got everyone up dancing all night. Happy New Year Charlotte. Hope 2014 is the best ever. Sounding wonderful! Have a fun New Year’s eve!! Hi Tracy, I had to tape in the hotel bedroom because of the band practising downstairs ;). I had to speed up because when I tried to send a slower version there wasn’t enough wifi to send a longer video! It was good to be out dancing, a bit odd not to be at home as usual on New Years Eve though. Happy New Year! I hope you have fun tonight. Your Twelve Days of Christmas blog is fun. I’m really enjoying it. Thank you so much. Thank you for sharing! Lovely! Have a wonderful time dancing tonight. Happy New Year! Hi Janice, it’s a real shame we English didn’t hold on to our barn dances and set dance card dances for parties that would be such fun. I love the Scottish Ceilidh dances. Super drawing. You are definitely an exceptional talent. So- where’s the disco ball? Have a happy and safe New Years. I looked like a disco ball TJ lol. I had a short silver sequin dress on, the host said I stood out so that’s cool! Hi Darren, I love knowing a Cherokee Indian, when my brother studied the American West I learnt some of the history too from his revision drawings. I did approach the band during a rest in their set to ask more about the band for my blog but I was told in no uncertain terms by one of their girlfriends they were resting and I wasn’t to bother them lol! They did a great performance though. Although, if I may venture a tiny word of critique, you seem to be singing a tad fast (one of the hazards of singing a cappella). So dedicated. I’m glad you had time to share your wonderful singing with us. The recording turned out quite well, especially considering what you had to do to make it happen! Great job! Hope the party was wonderful! Thanks Deborah, it was a very busy evening the place was full. I am enjoying these glimpses of your life with family and friends — and I love the seven swans. 10/10 ! excellent ! great ! Kiss! I send the french tomorow…..
Is your Dad speack french ? My parents both learnt French at night classes one hour per week for a year or so before my brother was born but it’s been over twenty years since they used it and say they’re too rusty to trust their spoken French. Perhaps when I start singing in French it might help them to remember. Happy New Year, Charlotte! I hope 2014 brings all you wish for. I recently saw in a friend’s home a work that startlingly reminded me of your art. Although this pic is not of that work, it’s very similiar. The genre is “fraktur” and is considered folk art by the Pennsylvania Dutch artists of the 18th and 19th centuries. Dads are great people for helping us sort things out. Your Dad did a fine job. 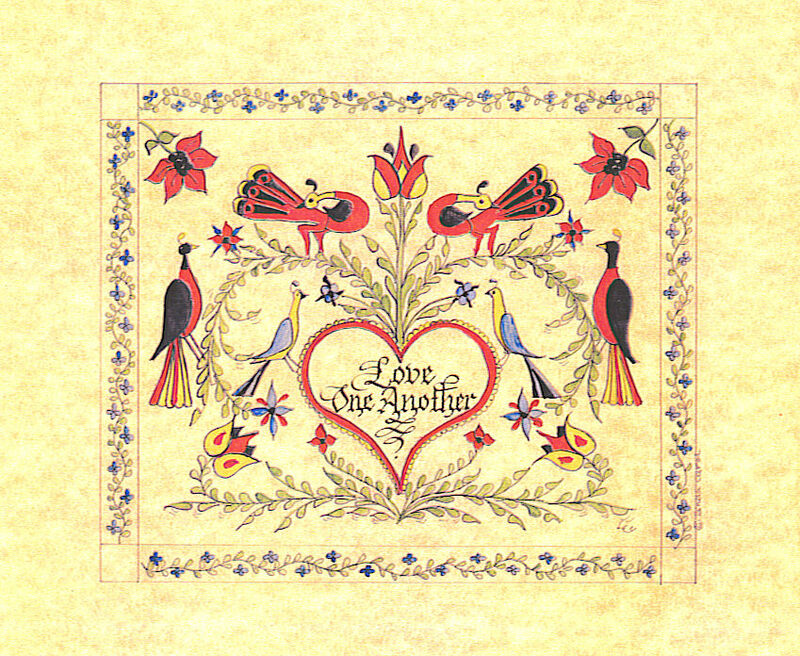 Art’s good too and it is like the fraktur art that Jim spoke of. That’s why the style seemed familiar. My Dad is fantastic at IT I couldn’t manage everything without his help all year round doing the videos for me and getting the photos right, you can tell the video I did by myself lol. Truly love the drawings. And hope you had a blast. Is it still true that in North Wales they speak more Welsh than English? Happy new year Lady Hoather. May it be filled with lots of love,laughter and smiles. Thanks Linda, I appreciate your good wishes. I’ll be sad to leave home but happy to be back at the Conservatoire next week. Looks like a great party in waiting. Hi Charlotte, May you have a very happy new year! May you have success in your career and in everything you sing! Thanks Uncle Spike ;). Last day today!